The fresh and natural flavors of a poke dish compel me to buy it every weekend. It’s safe to say that I am obsessed with this Hawaiian delicacy. Poke to me was a quick escape from reality. As you continue to read this post, you’ll discover all about poke and local poke restaurants in New York. Join the craze! It’s a native appetizer or main course that consists of diced raw fish such as salmon or tuna in Hawaii. In other words, it’s one of the main dishes to many native Hawaiians. The word “poke” (poh-kay) means to slice or cut. Hawaiian poke is heavily influenced by Japanese and other Asian cuisines. Therefore, it represents the diverse culture of Hawaii. 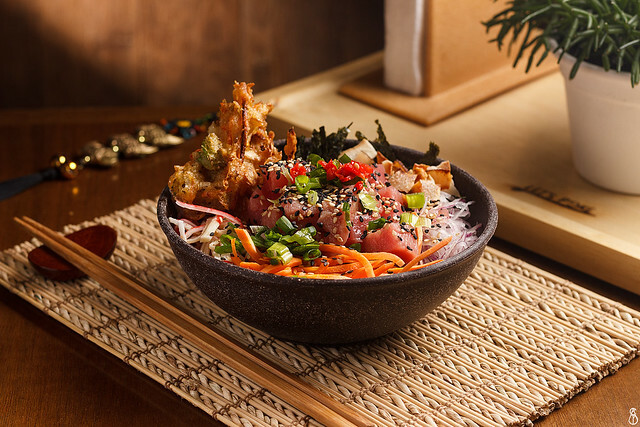 A poke bowl is made up of a base; rice, cubed sushi-grade raw fish, vegetables and Asian toppings such as seaweed or soy sauce. You must be hungry and thinking, “Is there poke near me?”. Here are my top places for a delicious poke bowl or dish in New York. For those who want just poke, everything at this place is affordable. A regular poke bowl at Pokeworks is 11.95 + and a poke burrito which is the same ingredients in a wrap is the same price. The regular signature bowl is $10.95 + and the large is $13.25. There are many sides to choose from such as miso soup or a kani salad. The Poke is also a great spot for vegans! Also, you can order Asian-style hand rolled ice cream with toppings! A very nice trendy and cozy environment to go with friends or family. You have a huge variety to create your poke bowl. Additionally, the staff is very friendly! They even have a “nacho supreme poke plenty bowl” for people craving spicy poke. This modern Hawaiian restaurant elegantly prepares brunch and dinner poke cuisines. They offer authentic poke Hawaiian food and meals such as mochiko chicken wings, grilled octopus, truffle gnocchi, mentaiko spaghetti and more! Lets’ not forget dessert!! You can also order a pineapple upside down cake, chocolate haupia sundae and SO much more! There’s even a wine list! Everything at this restaurant is under $40. Everything here is less than $15. You can order a classic poke bowl or anything different like wasabi or a tofu mix. My favorite at PokeWave is called Spam Bam which is spam, scallion and eel sauce. What are some of your favorite NY poke restaurants?